The Washington Capitals have made their mark by drafting goalies in recent years that quickly attain success at the pro level. They are currently led in net by 2008 fourth round draft pick Braden Holtby, who has grabbed a hold of the starting spot in the nation’s capital, posting a 2.92 goals against average and .911 save percentage in 20 games. They parted ways with 2006 first round pick net minder Semyon Varlamov a few years ago, sending the young goalie to the Colorado Avalanche as Holtby entered into Washington’s future plans. That trade was made possible by budding 24 year old Michal Neuvirth, another young Capitals goaltender, who has been relegated to backup duty behind Holtby during this shortened season. However, there’s still talent in Washington’s goalie pipeline. The young Philipp Grubauer has played in each pro league (ECHL, AHL, NHL) this season, a rare feat for any player, let alone a young net minder. Due to the NHL lockout, the German born net minder began the season with Washington’s newest ECHL affiliate, the Reading Royals. Following a stellar 2011-2012 campaign with the South Carolina Stingrays last season, where he posted a 23-13-5 record with a 2.22 goals against average, Grubauer posted similar numbers in his short time in Reading at the beginning of the 2012-2013 season. He only played in 26 games with the Royals, but sported an outstanding 19-5-1 record to go with an unbelievable 2.30 goals against average. 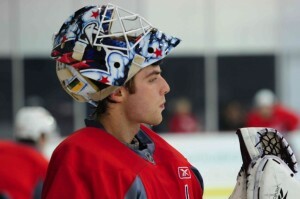 Following the resolution of the NHL lockout and the departure of Braden Holtby to Washington, Grubauer finally got his chance at the full time starting job in the AHL, with the Capitals AHL affiliate, the Hershey Bears. He’s turned out to be arguably the AHL’s best goalie, posting an insane 1.93 goals against average and .933 save percentage in 17 games. But due to his lack of minutes (996), he can’t contend for the top goalie in the league numbers wise, according to the AHL website. His closest competitor is Abbotsford Heat net minder Danny Taylor, who holds a 1.96 goals against average and .924 save percentage along with two shutouts on the year. You can get more information on Taylor from THW’s Ryan Pike, here. 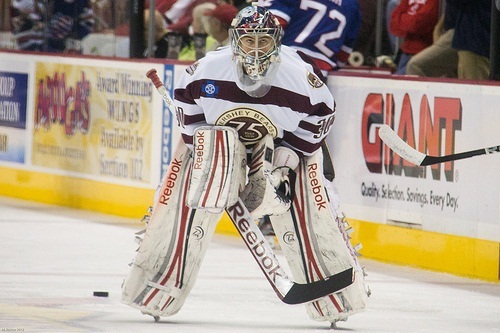 After joining the AHL, the 21 year old goaltender would get his first look at the NHL. He was called up following an illness to the Capitals’ Michal Neuvirth, and played backup duty for Braden Holtby against the Philadelphia Flyers. After four Philadelphia goals, Holtby was pulled in favor of Grubauer. Washington’s fourth round selection from the 2010 draft came up big, stopping all the shots he faced, earning him a start against the New York Islanders. In his two games at hockey’s highest level, Grubauer posted a .915 save percentage and 3.57 goals against average, inflated by Washington’s porous defense. Grubauer’s stint in the NHL, although short, has increased his confidence and he has carried what he’s learned back to the AHL. 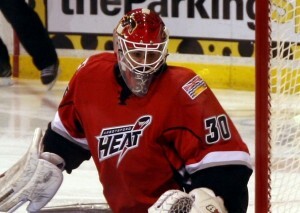 After being sent down, Grubauer continues to light up North America’s second best hockey league. He posted two wins last weekend against the Bridgeport Sound Tigers and Adirondack Phantoms. He posted a shutout against Bridgeport on March 16th, followed by a 36 save performance against the Flyers minor league affiliate the very next day. He just missed becoming Hershey’s first ever goalie to record shutouts on back to back days, a feat none has accomplished in over 75 years of hockey in Chocolate town USA. It’s uncertain when he’ll get a chance to play in Washington regularly, whether by a Michal Neuvirth trade or something else, but Grubauer is well on his way to becoming an elite NHL goaltender.